Concert season just never ends for us lucky Malaysians! We have recently been blessed with great news of international artists confirming their concerts, to be held in Malaysia this year! First off, we’re pretty sure all the fans cannot wait for Ed Sheeran’s Divide World Tour 2019 that’s happening this Saturday at Axiata Arena. Next up for the month of May, we have Jason Mraz making his second comeback to Malaysia for the Good Vibes Tour after his first performance in Malaysia, 10 years ago. Now for the month of June, here we have two male groups who are the South Korean boy group, Monsta X and the English Pop group, 911 to set foot in Malaysia to perform live on the same day, 22th of June. Both Taiwanese singer, Jam Hsiao and A-lin will also make an appearance in Malaysia for their concert on 6thof July and 20thof July respectively. Not to forget, August is gonna be an eventful month with the return of Westlife to Malaysia on 8thand 9thof August 2019. You can read more about what we are looking forward to the concert in another article here. Last but not least, K-Pop girl group, TWICE will also be visiting Malaysia on 17thof August for their world tour 2019! 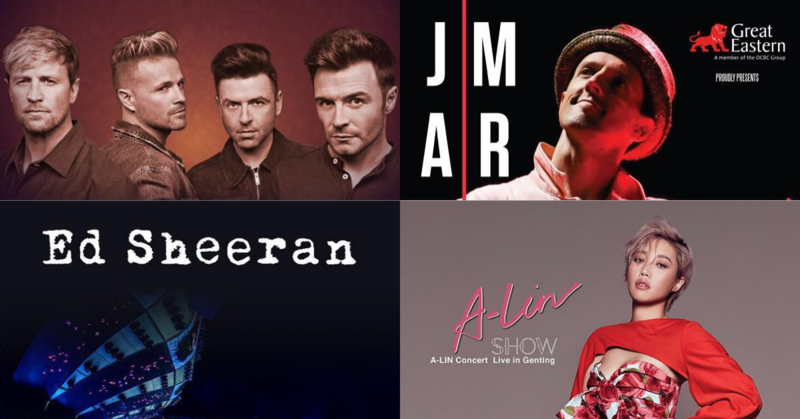 Have we missed out on any of your favourite artists, coming to Malaysia? Let us know in the comments!